A mix of organic flours (wholegrain oat, wheat, rye & rice) banana flakes & small pieces of dried plum with added vitamin B1. Their organic stage 2 porridge is the perfect next step when you and your baby are ready to move on to try new textures. There are small crispy pieces and tiny plum chunks for them to explore and enjoy, creating a softly chewable texture. With no added sugar, artificial flavours or sweeteners, the banana and plum provide all the flavour. Learning to understand the feeling of texture is great early on as it helps your baby to tackle more difficult textures later. But don't worry if your baby finds it challenging to start with, stop and try again in a few days. Keep repeating this and your baby will be familiar with the new texture in no time. If your little one wants to explore more textures why not add some grated apple or pieces of banana. When your baby's starting out, keep tastes simple and textures smooth. Like our baby rice or Stage 1 porridges, both with light and fluffy textures. If you and your baby are ready to move on, try our Stage 2 cereals. There are small crispy pieces and tiny chewable chunks of real organic fruit for them to explore and enjoy. As your baby's sense of adventure with food grows, try more of a mix with our Stage 3 muesli. With chunky oats, pieces of fruit and crispy puffs they really get those little mouths going and starting to chew. They launched in 1992 with some fundamental beliefs: that everybody, no matter how young, deserves to eat well and that great-tasting organic ingredients and delicious recipes can encourage a life-long love of food. We've stuck to them fanatically. We're committed to never adding anything unnecessary and to setting standards, it's called our No Junk Promise. We're campaigning for change in the food industry, school, nurseries & restaurants. All because we want the best for you on every step of your little one's journey, from us all at Organix. Wholegrain Oat Flakes (contains Gluten) 30%, Wholegrain Oat Flour (contains Gluten) 17%, Banana Flakes 16%, Wholegrain Wheat Flour (contains Gluten) 15%, Wholegrain Rye Flour (contains Gluten) 10%, Dried Plum Pieces 8%, Puffed Wholegrain Rice Flour 4%, Thiamin (Vitamin B1*) <1%, Total 100%, *Thiamin (Vitamin B1) has no Organic certification. 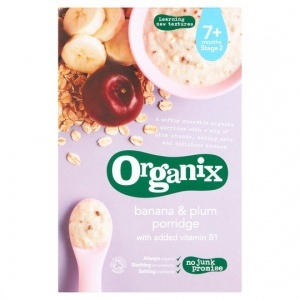 100g of dry porridge provides † : Energy 1540kJ/365kcal, Fat 3.9g, of which saturates 0.7g, Carbohydrate 67.8g, of which sugars 13.8g, Fibre 9.2g, Protein 10.0g, Sodium 0.01g, Salt 0.03g, Thiamin (Vitamin B1) 0.8mg, Contains naturally occurring sugars, † Approximately 9 portions per pack. 1 Pop 3 level tbsp of porridge into baby's bowl. 2 Add 6 tbsp of baby's usual milk, cold or warmed. 3 Mix well and serve within 30 mins (thickens over time). If serving warm, check the temperature before feeding. This is only a guide and you know your baby best, so add more milk or porridge if your baby prefers a slightly different consistency or is hungrier. To ensure your baby enjoys the great taste of our porridge store in an airtight container and use within 28 days. When feeding child, please ensure that they are sitting down and supervised to reduce the risk of choking.